Thanksgiving is the best, right? Family, friends, cooking, football, good wine, and the inevitable lounge afterward. Though I know not every Thanksgiving is stress-free or drama-free, the thought of all those smiling faces gathered around tables gives me all the warm feels. Do you dress up for Thanksgiving? I would say our family tends to be casual dressy, but I know plenty of dress codes are happening. I would say pants are off the table, because zips and buttons in the mid section are no friend to this holiday. 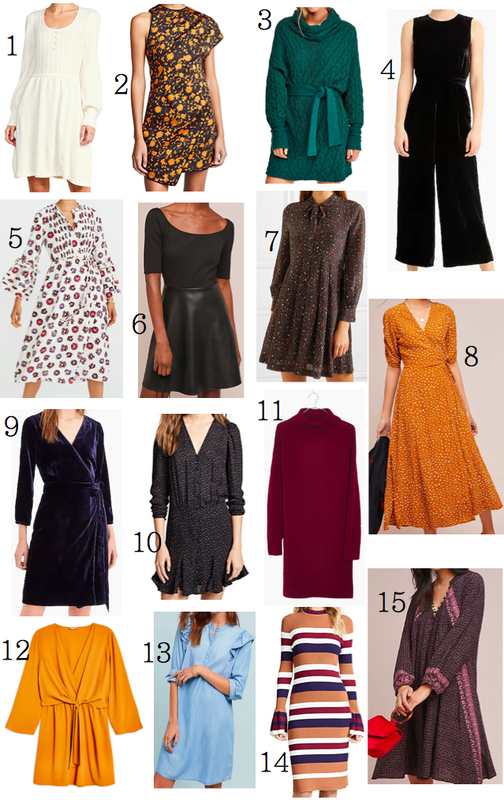 It is safe to say I want EVERY ONE of these as the prints and colors are giving me all the holiday vibes. So cheers to full tummys, happy tables, and the perfect dress for it all.